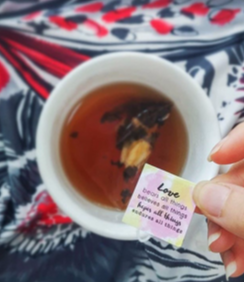 If you’re looking for a practical, meaningful and unique wedding favour for upcoming big day, look no further than teas that are tagged with inspirational quotes! Easy to drink, with a range of fruity, floral and interesting blends (that smell oh so good! ), we made sure each pyramid tea bag is filled with premium loose leaves that provide a full flavour for a regular mug, with more than one steep per tea bag! More importantly, our wedding poches are fully customisable; perfect for any theme, these gifts serve as a unique memorable gift for your important guests to bring home. Use your pre-wedding picture, draw a caricature, pick your favourite quote or image, follow the design of your wedding invite or customise it completely to your theme – let your imagination soar! Compare this with the usual boring wedding favours we all receive; we believe that these customised tea poches that inspire your guests, will definitely be a boost! We trust that our Collaboration Tea poches will enhance your wedding experience and they look great on pictures too! Let our special wedding favour serve as a reminder of your wonderful big day!